Saul Bellow had what one of his characters in Ravelstein calls ‘a gift for reading reality – the impulse to put your loving face to it and press your hands against it’. Bellow seems to outstrip other novelists in his unembarrassed wish to get as close as possible to the reality of people – their faces, clothes, bodies, speech, gestures. If Bellow’s love for his characters was often contentious and double-edged, well what is love if not the highest form of contention? Bellow was a personality worthy of his own fictions, a lively, inspired troublemaker, as Zachary Leader shows in the second volume of his magisterial biography. He was ‘a great chain-yanker’ during arguments, his son Daniel said, adding, ‘He liked to dig a pit and cover it with branches so you’d come walking along, whistling away, and fall right in it. Then he would stand at the edge and watch you as you sort of thrashed around. He liked that.’ His agent Henry Volkening noted, ‘He has a way of giving a look – sharp and penetrating – that can scare you to death, a no-place-to-hide feeling.’ Yet Bellow was not at bottom stern and scolding. Rather, he was a life-driven enthusiast, even if, Chicago-reared and well armed, he was wary too. He got carried away with literature, friendship, family and, perhaps above all, women. He was married five times, the last time to a woman forty-three years his junior; in between, he had a boatload of affairs. Leader’s biography is a monumental piece of scholarship, not least because he untangles the details of all those love affairs. It is also thrilling to read. Leader has spoken to everyone still alive who knew Bellow. Dozens of them spring energetically from his pages. This second volume is longer than the first, which went up to 1964, the year of Herzog, the book that made Bellow famous. Here the cast of characters is much larger: a flotilla of girlfriends, wives, sons, brothers, would-be biographers, ‘major lunatics’, stalkers (including crackpot Herzog wannabes who fired endless letters at Bellow), hangers-on, critics, fellow writers, best friends and direst enemies. The last two categories could at different times contain the same person, as in the case of Edward Shils, the stringent sociologist who first brought Bellow to Chicago’s Committee on Social Thought, that powerhouse academic unit where Bellow taught for thirty years. At first Bellow looked up to Shils and they were constant companions, but later they fell out. Shils was irritated by the character of Sammler in Mr Sammler’s Planet, which he suspected was partly based on him, and he was irate about Bellow’s efforts to get several old girlfriends hired at Social Thought (‘I refuse to let him use the Committee as a rest home for his old nafkas [Yiddish for whores]’, Shils reportedly complained). A perturbed Bellow ruthlessly satirised Shils as the red-faced, tyrannical Rakhmiel Kogon in Ravelstein. Bellow ‘lived on turbulence’, Simmons comments. ‘He caused it, and he set scenes.’ Yet he always saw himself as a victim rather than a perpetrator of the mishegas that engulfed him. 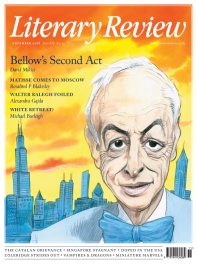 ‘Litigants and lawyers still keep me nailed down in Chicago,’ Bellow wrote to a friend in 1979, while the aftershocks of his divorce from his third wife, Susan Glassman, years earlier were continuing to reverberate. ‘There are subtle and delicate threads that hold me down like Gulliver. I am bristling with Lilliputian arrows, they itch horribly. I am putting myself under the care of a dermatologist – that is literally true.’ Bellow felt shredded by Susan. Two years earlier, she had charged him with neglecting their son: ‘You’re the father, not the child,’ she jabbed. We see Bellow caught between the demands of writing, political commitment and personal loyalty. Leader describes Bellow’s appearance at the White House Festival of the Arts in 1965, despite his disapproval of Johnson’s involvement in Vietnam and the Dominican Republic, and despite intense pressure from his fellow writers to denounce LBJ. ‘I wouldn’t have gone at all if I hadn’t been obliged by my own obstinacy to mark my disagreement with all parties,’ Bellow characteristically noted. Leader excels at conveying the larger social world, whether the subject is cut-throat Chicago power politics of the kind that fascinated Bellow or the minor spats of academic life. He masterfully portrays the tension between African-Americans and Jews in Chicago in the 1980s and 1990s, when University of Chicago students were regularly mugged or raped, and an aide to Chicago’s mayor, with the tacit support of most of his colleagues, accused Jewish doctors of injecting black Americans with the HIV virus. He describes the capitulation of the authorities at Cornell University to armed Black Power activists in the 1970s, a pivotal event for Allan Bloom, who became Bellow’s closest friend at the Committee on Social Thought. Bloom, a philosopher and classicist, became the basis for the titular protagonist of Ravelstein. The common image of Bellow as a cranky elitist is wrong. He had a deep concern for the conditions experienced by the African-American underclass, which he depicted in The Dean’s December, the most sombre of his books. The novel drew on Bellow’s interviews with politicians and social workers and his extensive research into Chicago’s dismal housing projects and prisons. Bellow’s sense of the plight of black Chicago was metaphysical and urgent: since they had been ‘written off’ by white America, the urban ghetto dwellers lived in a world apart, like damned souls, as the Jews of Europe had during the Holocaust. He was less interested in the discrimination that lay at the root of their condition than he was in the terrible reality of that condition itself. Liberal wishful thinking, Bellow insisted, had to be swept aside so everyone could see the barbaric inferno that had engulfed Chicago’s poorest communities. None of this makes him a racist, as some critics charged, though his comments about race were at times intended to provoke. On The Dean’s December as well as Bellow’s other post-Herzog books, Leader is an astute literary critic. He is particularly good on Mr Sammler’s Planet, rescuing that book from its undeserved reputation as a crabby, misanthropic salvo against the counterculture. Bellow was not Sammler, Leader shows, and the author clearly had feelings for Sammler’s kooky Sixties antagonists as well as for the Polish-Jewish sage he created. Bellow was a man of ideas, though never that cardboard being, a novelist of ideas. In him the old feud between philosophy and poetry took on new life. He had a strange yen for the musings of Rudolf Steiner and established an awkward friendship with Owen Barfield, Steiner’s British apostle. Later, he gravitated to Bloom’s Leo Strauss-influenced ideas, though, as he admitted, Athens and Jerusalem were not his dish. The novels speak truer than any theories. For Bellow, human personality was the motor of history, politics and love. It lay at the root of ideology too, a perspective alien to the cultural-studies approach ascendant in the academy today. Bellow said to an earlier biographer, ‘I don’t want my last tatters exposed … my poor porous fig leaf.’ With this enthralling, massively detailed book, Leader has not laid Bellow bare so much as enriched him. He honours Bellow for his artistic genius as well as his expressive, tough personality, giving us what Abe Ravelstein asked for, a full picture, warts and all – since the only way to see how marvellous someone was is to see how much trouble they were too.